When it comes to strength, appearance, fabrication, and torsion, welded mechanical steel tubing comes out first, and California Steel and Tube is the only mechanical tube fabricator in the western US. California Steel and Tube produces quality steel tubing from five tube mills, two slitting lines, and a range of accessory equipment. We manufacture steel of the highest quality to exact customer specification and provide a large inventory of hot rolled pickled and oiled, cold rolled commercial quality, and pre-galvanized steel, plus special purpose steel grades such as aluminum killed, drawing quality, and structural grade. Ideas take shape – an infinite variety of shapes, in fact – with tubing. Starting with one tube mill over fifty years ago, California Steel and Tube is now producing quality welded steel tubing from five tube mills, two slitting lines and accessory equipment for further processing. 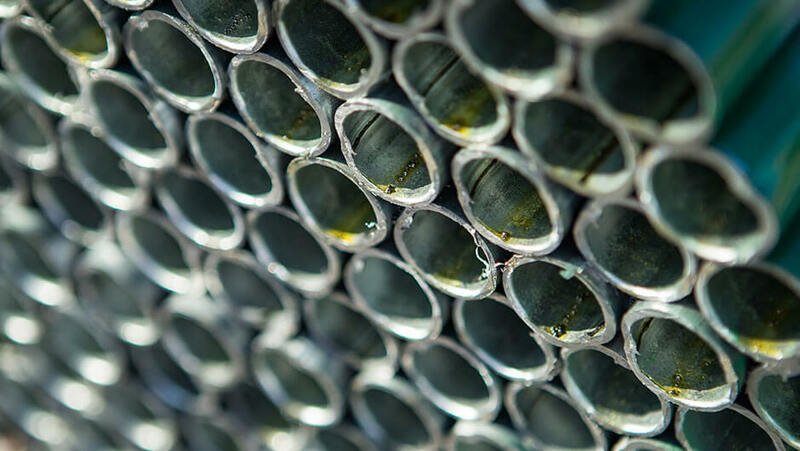 Welded mechanical steel tubing is used in a multitude of applications where strength, appearance, ease of fabrication, resistance to torsion, and maximum strength to weight ratio are required. Having earned an enviable reputation for quality and service, the company is a major supplier to many key industries. Each month millions of feet are supplied for exercise equipment, home and office furniture, automotive products, material handling products, garden equipment, display racks, trusses, fencing, and a variety of specialty products. All tubing is produced to exact customer specifications to meet the customers’ specific requirements. Accessory equipment permits the company to supply exact lengths, with the ends deburred where necessary, plus flattening, punching, etc. Steel of the highest quality, purchased to exact specifications, provides a large inventory of hot rolled pickled and oiled, cold rolled commercial quality and pre-galvanized – plus special purpose steel such as aluminum killed, drawing quality and structural grades. Let your ideas take shape in steel tubing and let California Steel and Tube help you turn those ideas into saleable products. Automotive headers, roll bars, side steps, brush guards, camper jacks, motorcycle accessories and exhaust systems, and boat trailers. Dinette sets, desks, chairs, bed frames, patio furniture, convertible sofas, chairs, store display fixtures, and lighting products. Ornamental iron fences, gates, trusses, and scaffolding. Health and exercise machines, wheel chairs and walkers, racks, wheel barrows, hopping carts, lawn mowers, and grass cutters. Since our humble start as a warehouse over 60 years ago, California Steel & Tube has become known regionally as the only mechanical tube fabricator west of the Mississippi and nationally as a top steel fabricator. After over 60 years in the steel tubing business, California Steel & Tube has unparalleled expertise in mechanical tubing. We boast broad capabilities in custom steel fabrication and can manufacture steel tubing to precise customer specification.